There is something special about the shifting moral perspectives in The Walking Dead. I hope I got across in my PopMatters piece my fascination with the crazy new social landscape we find ourselves in. What makes this latest Season of Telltale's smash hit so interesting is not that Clementine is a little girl, though yes, that plays an important part. What makes this season special is that how we view our own actions matters more, perhaps, than ever. In this last episode, Clementine reminisces with an old friend about Lee. This is not just idle chatter, this is a pointed reminder that you, as the player, set the context for the current version of Clementine. You lived Clementine's past, from a unique perspective, which makes the background all that much more meaningful. 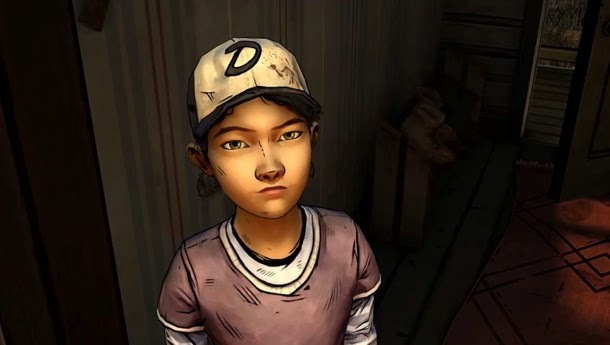 Ask yourself, when finishing Season 2 Episode 2, what would Lee say to you, Clementine, about your decisions? Would he agree with them? Would he say you are upholding his moral precedent? I honestly don't know. There are times where I feel as though I am letting my version of Lee down in some way, as though my decisions fail to recognize the reason he gave his life to save me. That burden, which I carry as a player making moral choices, is the same burden Clementine, as a fatherless-child, must also surely carry. But her decisions are her own, as much as they are mine, insofar as Lee was never so small, never so overlooked, and never so exploited. How do you move on yet maintain a clear moral path? It's not easy. What I recognize now, after writing about the game and discussing the episode on the podcast, is that all of this is almost certainly intentional. Little phrases thrown here and there, upon reflection, hold such enormity. The writers over at Telltale still got "it", whatever that may be, and I can't wait to get more.